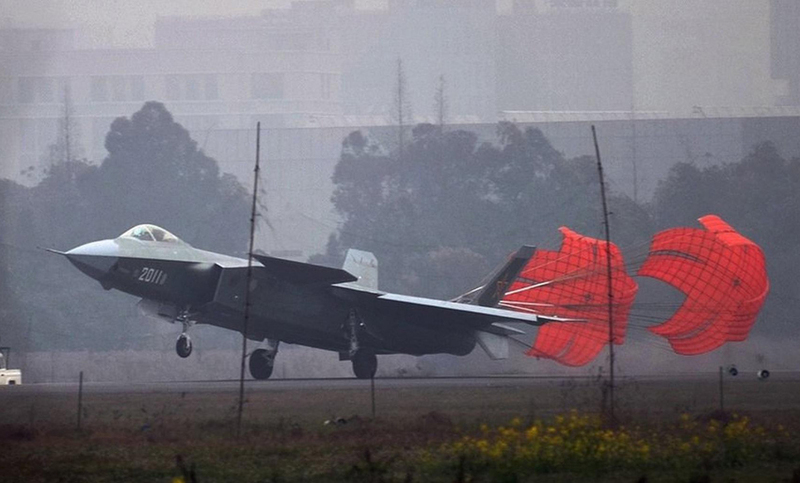 The latest example of the stealthy Chengdu J-20 fighter has recently undergone high-speed taxi testing at the company airfield, suggesting that a first flight is imminent, possibly scheduled for this weekend. Thought to be the third flying example of the J-20, the new aircraft is being considered as a true developmental airframe for an operational fighter, and has introduced a number of significant improvements over the two technology demonstrators that preceded it. Many of the changes are measures taken to reduce the type’s radar cross section. With the side number 2011, the new J-20 introduces sawtooth trailing edges on the two engine nozzles. It also has the aft tips of its all-moving vertical fins cropped, a feature that has been applied to at least one of the earlier aircraft. Aircraft 2011 additionally has the tips of the canard foreplanes cropped. The engine intakes have been redesigned with a sloping upper edge and larger capture area, while the underwing fairings for the control-surface actuators have been reprofiled and reduced in size. The main weapon bay doors have been redesigned with a more sophisticated sawtooth pattern on leading and trailing edges, while the nosewheel door pattern has been simplified. Most noticeable, however, is a new paint scheme with what appears to be a special coating applied to the edges of the wings and tail surfaces. Another notable change is the addition of a low-profile fairing under the nose for an electro-optical/infrared sensor, which may provide an air-to-ground function as well as air-to-air tracking capability. Prototype 2002, the first with radar, appeared earlier with a pedestal for an infrared search-and-track system forward of the windshield, but aircraft 2011 has an undernose installation redolent of the EOTS (electro-optical targeting system) fitted to the Lockheed Martin F-35. The J-20’s radome, with canted bulkhead, almost certainly houses an AESA radar. One further change for aircraft 2011 is the addition of a solid arch frame to the one-piece canopy. Meanwhile, the first two J-20s (2001 and 2002) have been active at the CTFE (China flight-test establishment) at Yanliang, to which they were transferred from Chengdu in 2012. Google Earth imagery from Yanliang has provided a good size comparison with the slightly larger Sukhoi Flanker. Sightings of a “2003” and “2004” have thrown some confusion on the exact number of J-20s, but it is likely that the first two machines have either been renumbered or photos have been faked. Aircraft 2002 was used to perform initial tests with the J-20’s innovative missile launch system for the side bays, in which the bay doors close after the PL-10 missile has been swung out into the airstream before firing. This is an advance on the F-22’s side bay system, in which the bay doors remain open throughout the whole deployment/firing sequence, with a consequent penalty in radar cross section. Another aircraft, almost certainly 2001, has recently appeared in a silvery scheme with a dark radome, and with its fin tips cropped like those on 2011. This aircraft may have been conducting tests with a radar-absorbent material.